Maintain OVERWEIGHT on sector, Top Picks are Delfi, Thai Beverage and Sheng Siong. YTD, the consumer sector has underperformed the STI. We believe consumer confidence in Singapore has peaked, but think there are still pockets of opportunities in companies with strong attributes and a bottom-up growth story. As tailwinds from buoyant GDP growth and wealth effects from financial markets and property prices diminished, growing within Singapore’s domestic market is going to be more challenging this year. In the Singapore retail sub-sector, we prefer SHENG SIONG GROUP LTD (SGX:OV8), as it is likely see earnings growth coming from higher revenue and margin improvements on the 10 new stores opened in 2018. …but more consumption in ASEAN. Most of the consumer names under our coverage have market exposure outside of Singapore. Amongst these, we like DELFI LIMITED (SGX:P34) and THAI BEVERAGE PUBLIC CO LTD (SGX:Y92) which operate in Indonesia and Thailand respectively. Both of these companies are likely to benefit from improved domestic consumption during the election year, as well as healthy GDP growth of c.4%-5%. Singapore’s retail sector started off on a high note in 2018, led by an improved wealth effect and strong GDP growth towards the end of 2017. As GDP growth moderates and the property market decelerates, we believe consumer confidence has peaked. We foresee a more benign consumer sentiment for 2019, amidst an uncertain macroeconomic outlook, and expect Singaporeans to be prudent spenders in 2019. Non-staples retail should be more affected by slower GDP growth and continued competition from e-commerce. The increased penetration of e-commerce has allowed consumers to compare prices more efficiently. Amidst the more cautious sentiment, consumers are more likely to delay the purchase of non-staple/durable goods to the sales period for better deals. We believe this consumer behaviour will be fortified, given that online marketplaces such as Qoo10, Lazada and Shoppee now hold more promotional periods than in the past. In recent years, there were smaller-scale shopping days like 9.9 (9 Sep), 10.10 (10 Oct) and 12.12 (12 Dec), on top of the usual black Friday and 11.11 (ie Singles’ Day) sale. Smaller e-commerce players are also increasingly joining these big players to offer big discounts on those dates. The increased frequency of these online sales dates allow consumers to hold off non-urgent purchases, and reduce the need for an immediate purchase at brick-and-mortar stores. As a result, we believe e-commerce will continue to give brick-and-mortar retailers a run for their money – especially those in the durables and non-staples space. Aside from travel bookings, electronics, fashion & beauty and furniture & appliances are amongst the top categories by e-commerce spending in Singapore, according to We Are Social. Retail players in these segments should be most affected by e-commerce. More challenges for consumer foodservice providers. Food and beverage (F&B) retail are more resilient to e-commerce, but not entirely immune. As other brick-and-mortar retailers were threatened by e-commerce, retail malls are increasingly raising the proportion of tenant mix from F&B players. Against a stagnant population and slow growth in F&B expenditure, the increase in the number of F&B establishments has greatly intensified competition in this field. Separately, the advent of delivery apps like Deliveroo, Foodpanda and Grab Food is sometimes a double-edged sword for the F&B players. While they can help reach out to a wider range of customers, this often comes at a high cost – with some players saying that delivery apps charge as high as c.25% of revenue. Figure 4 in attached PDF report shows that the F&B services index has not grown significantly since the emergence of major food delivery apps in 2012-2016. This meant that the industry could be squeezed by both increases in fixed costs from more F&B establishments and delivery charges paid to delivery apps. On top of that, the Singaporean Government could be tightening the foreign worker Dependency Ratio Ceiling for the services sector to 38% in 2020 and 35% in 2021, from 40%. Companies that have not adequately prepared for automation should face further labour cost pressures or a labour crunch in the next two years. We are largely neutral on the consumer foodservice names we cover. We remain NEUTRAL on KIMLY LIMITED (SGX:1D0) (Rating: NEUTRAL, Target Price: SGD0.24) and JAPAN FOODS HOLDING LTD. (SGX:5OI) (Rating: NEUTRAL, Target Price: SGD0.45). Given the lack of growth in overall F&B retail expenditure, firms with stronger attributes would be growing at the expense of weaker ones. We like JUMBO GROUP LIMITED (SGX:42R), which has strong brand name in the seafood space and is able to command strong gross margin. Its FY19F earnings could do better on the back of new stores opening in Singapore and higher franchise income. We also like BREADTALK GROUP LIMITED (SGX:CTN)’s (Rating: NEUTRAL, Target Price: SGD0.81) whose Din Tai Fung brand remains popular for its quality food at mass market ticket size. On costs, we believe firms with central kitchens like KOUFU GROUP LIMITED (SGX:VL6) and BreadTalk should be less affected by the tightening of foreign labour requirements, given the potential for their central kitchens to take on more processes and reduce manpower reliance. Grocery retailers also face similar challenges. The main challenge for the grocery players was the sudden upsurge in the number of new outlets in 2018. According to Euromonitor, the total number of supermarkets and hypermarkets surged by 14 (+4%) in 2018, the highest increase in 5 years. Coupled with slower growth in the economy, SSSG turned negative in 4Q18. This was largely attributed to the higher supply of new sites available from the Housing Development Board (HDB) that was assigned for supermarkets last year. However, we believe the problem grocery retailers face is more cyclical than structural compared to the F&B players. This is because the total number of supermarkets and hypermarkets outlets has only expanded by 1.6% over the last 5 years. We believe the sudden oversupply of grocery retailers is largely a timing issue and note that the number of new HDB sites available for bids (for supermarkets) has also moderated for 2019. Online competition is here to stay. Online grocery services in Singapore is still at a nascent phase. Today, we estimate the online format to constitute approximately 3-4% of Singapore’s grocery market. That said, the intensity of online competition has peaked. Redmart has been in Singapore since 2011. On 15 Mar, it moved its app onto the Lazada platform. New orders are no longer accepted on Redmart’s app or website. While we believe the consolidation of Redmart and the Lazada platform will bring about greater efficiency and cost savings for the company, there is no obvious benefit to the consumers except for the SGD25 worth of vouchers for existing customers who opted to move their accounts from Redmart to Lazada. On the other hand, Amazon Prime Now, launched in Jul 2017, has lost its hype after it introduced Prime membership fees in December that year. We believe there will be a continued gradual diffusion of customers from brick-and-mortar stores to e-commerce, as consumers become more familiar and comfortable with shopping online. Incumbents will have to improve their online platforms or open in strategic locations to compete on convenience, while offering good quality and value. That said, we prefer SHENG SIONG GROUP LTD (SGX:OV8) (Rating: BUY, Target Price: SGD1.25) over DAIRY FARM INT'L HOLDINGS LTD (SGX:D01) (Rating: BUY, Target Price: USD8.25) amongst the grocery retail names we cover. We believe Sheng Siong has more to offer in terms of organic growth. The group opened 10 new stores in 2018, which should see revenue maturing this year to offset the higher fixed costs. Sheng Siong is also unlikely to face severe labour crunch issues over the next two years as it will be rolling out hybrid payment machines in the remaining 30% of its stores, which should help to reduce manpower reliance. 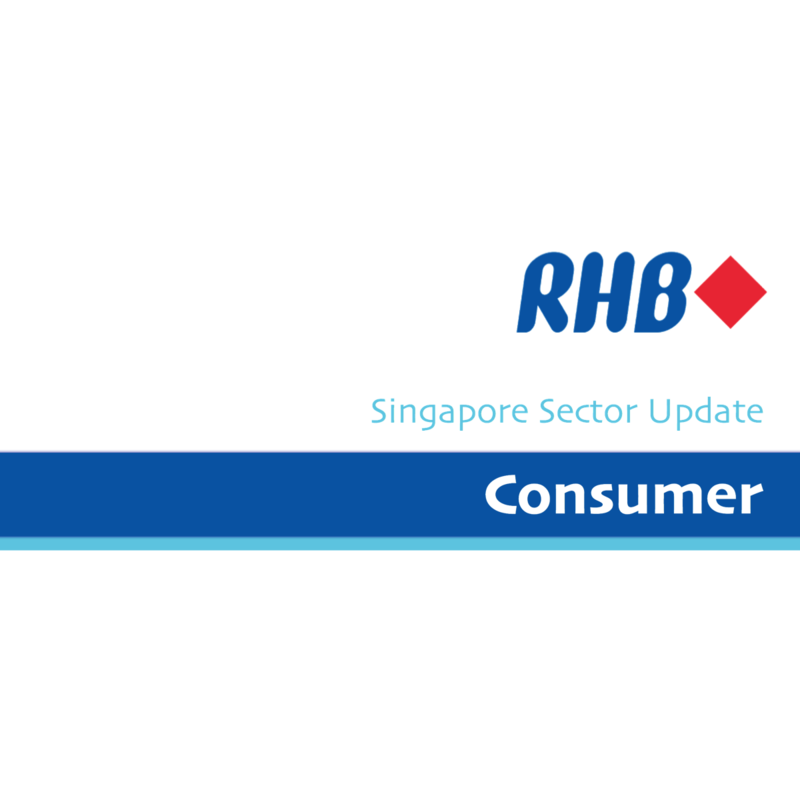 This year, with the stabilisation of regional currencies, we are generally overweight on the consumer goods names under our coverage, especially those with market exposure outside of Singapore. Of these, we prefer DELFI LIMITED (SGX:P34) (Rating: BUY, Target Price: SGD1.68). We expect to see improved domestic consumption for its core market, Indonesia, driven by the general election year and decent FY19F GDP growth of 5.1%. We also like THAI BEVERAGE PUBLIC CO LTD (SGX:Y92) (Rating: BUY, TP: SGD0.92) which continues to see recovery in alcohol demand. DELFI LIMITED (SGX:P34) is one of our top picks amongst the Singapore-listed consumer names. It is the leading chocolate confectionery player in Indonesia in terms of market share. Prior to 2018, Delfi downsized its product portfolio to focus more on growing the premium and higher-value product range. With a steady 5% growth in the country’s GDP, we think Delfi is well-positioned to leverage on the rising middle class and higher purchasing power in Indonesia. In addition, with the general election looming, we expect consumer sentiment to remain buoyant. We forecast 19% growth in FY19F earnings, driven by strong revenue growth and improved operating leverage as fixed costs stabilised. Our investment thesis for Delfi is further strengthened by the stabilising of IDR vs USD this year. Alcohol consumption recovery continues for THAI BEVERAGE PUBLIC CO LTD (SGX:Y92). We believe there is still some upside to Thai Beverage’s share price. While the recent general election has put a mixed outlook to the new government, we believe near-term alcohol demand would continue to recover in Thailand on the back of improving farm income. According to Thailand Office of Industrial Statistics, beer production for Jan-Feb 2019 increased by 5.2% y-o-y. We expect demand for Thai Beverage products to grow at a similar rate to its industry production figures. Thai Beverage’s spirits volumes may, however, see slower y-o-y growth in 2QFY19 (ie Jan-Mar) as the elderly tax implemented on 26 Jan 2018 could lead to higher trade sales in Jan 2018 and create a higher base effect. Nonetheless, we expect overall end-consumer demand to improve against the weaker sentiment in 2018. Additional stimulus packages after the new Cabinet is established should help to drive further improvement in domestic consumption. BEST WORLD INTERNATIONAL LTD (SGX:CGN) – best when entered at the right price. We still have a contrarian BUY call on the stock with a Target Price of SGD2.95. Best World’s share price declined recently due to concerns on the sustainability of its China growth and the lack of brand visibility from online searches. However, we note that management was still expecting 50% y-o-y growth in end-consumer demand for the China market during its 4Q18 results briefing. As such, we believe growth momentum should still be strong in the near term. Currently, we forecast net earnings to grow at 52% for FY19. While the lack of visibility in Best World’s direct-selling and franchise model suggests that investors should be cautious, we believe that its current share price, at below SGD2.10, is very compelling and could offer substantial upside to investors to justify the risk. In terms of valuations, most of the consumer stocks are trading below their 5-year historical P/Es. As such, valuations are not stretched yet. Improvement in the macro-economic outlook could lift overall sentiment and the sector’s valuation. For our sector top picks, we prefer quality names like Delfi, Thai Beverage and Sheng Siong, which offer stable earnings growth at decent valuations.